Time has turned Amin into a symbol of evil, on a par with Hitler and Stalin. While not a serious contender for the title of most bloodthirsty dictator of our time, his antics on the world stage in the 70's have nevertheless ensured a long line of books, of which Amin's Uganda is the latest, about this short period in the history of Uganda. The authors served in Uganda in the EAP&T Corporation for four out of the eight years Amin was in power. Walker, arriving in 1964 two years after Independence, experienced something of what life had been like in Colonial days, and was therefore able to judge the full extent of the slide into chaos after Independence. Measures came five years later, in time to experience the events that followed the unsuccessful attempt to assassinate Obote, the first Prime Minister. Both had long previous service in East Africa. Their tale begins with Measures' arrival in 1969, by which time the country had already suffered several major constitutional upheavals - the abolition of the native Ugandan Kingdoms, the expulsion of the Kabaka and the dissolution of the Lukiko - as Obote pursued his aim of a socialist dictatorship. These events are covered in the first chapter, which takes the story up to the end of 1970. 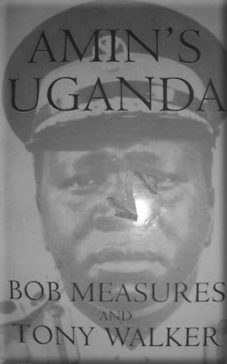 The next chapter describes Obote's plans to remove the Army Commander, Maj.Gen.Amin, whom he saw as the last remaining threat to his own position as President; how Amin turned the tables on him; and the general euphoria that followed the downfall of the hated Obote in the coup of January 1971. The ensuing struggle (which was to last over two years) as Obote, from his base in Tanzania and with the help of his friend Julius Nyerere, sought to oust Amin is the background to the next three chapters. The Army and the Civil Service were the first to be purged, but soon anyone suspected of opposing the regime was ruthlessly hunted down, beaten and tortured or killed. Then, as the economy began to fail, white - mostly British - businesses were expropriated; the Asian community expelled (with disastrous consequences for the tea, coffee and cotton industries); Arab aid invoked; and Eastern embassies wooed. Appalled by these actions many of the excellent Ministers Amin had first appointed from among the ranks of the Permanent Secretaries protested - only to be replaced by inexperienced and uneducated Army officers. As the chaos increased shortages of everything multiplied, armed robberies became endemic, services broke down and drunken soldiers manning road blocks became an everyday hazard. Finally, in mid '73, Obote made one last attempt to return. The invasion, mounted from Tanzania, was easily defeated. From then on opposition became muted and life we are told became easier for all. But it was too late. The Army was incapable of government. Towards the end of 1975 our authors had had enough and moved to Kenya, whence they continued to observe and record the many bizarre happenings in Uganda until Amin's final downfall in 1979. The story of how they lived and continued with their jobs in the esoteric world of Posts and Telegraphs, despite all that was going on around them, is the stuff of this book. That they were able to maintain communications within and outside Uganda throughout those years providing, incidentally, a service vital to the regime (for which they were accorded special protection) is a tribute to their skill and ingenuity. Their brave Ugandan colleagues (for whom life was very different) gave them every help and consideration. For readers who served in the EAP&T this book will be full of interest. For the general reader it is the extraordinary events of the Amin years and the way the few hundred remaining expatriate residents survived them, without losing the ability to enjoy what Uganda still had to offer in the way of Game Parks, sailing on the Lakes, bridge, golf, tennis and swimming that provides the main interest. For old Africa hands there is little to surprise, more to regret.